Marcus Robinson (#10), Tommy Bowen (#4) and Landon Henry (#2) defending the basket for Wilkes. 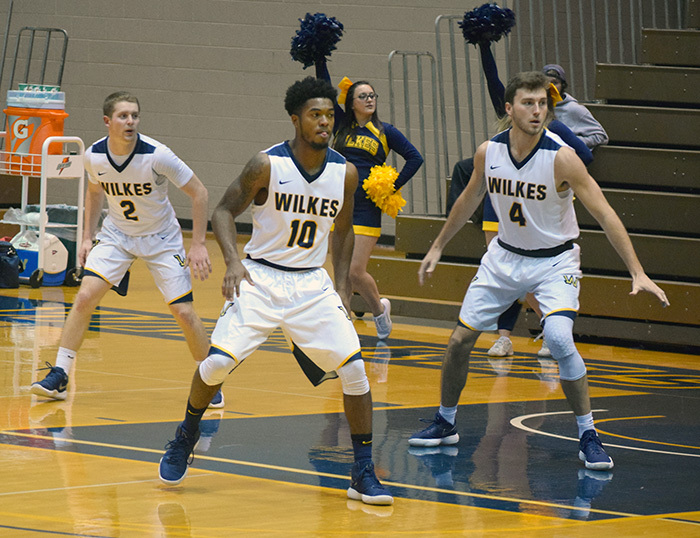 DALLAS, Pa. — The Wilkes University Colonels continued their winning ways Wednesday night with a huge overtime win on the road at Misericordia. The win was the Colonels seventh in eight games and they now have a 6-1 conference record, which puts them in sole possession of first place in MAC Freedom. The Cougars came into this game trying to bounce back from their first conference loss of the season, falling 90-83 to DeSales. With the loss Wednesday night, the Misericordia Cougars have now lost two in a row. The skid has cost the Cougars and now sit in a three way tie for second with a 5-2 record. The game started out very well for the Colonels as they jumped out to an early lead in the first. It did not take long for the Cougars to wake up though as they quickly surged back to eventually take the lead. The Cougars leading scorer, Jason Kenny, was a non-factor in the first half, which forced the Cougars supporting cast to make plays. The Cougars held the lead for most of the half once they took the lead, but a late surge in the final minutes of the half saw the Colonels jump out to a 37-29 point halftime lead. The Colonels came out in the second half with a big three-point shot made by Connor Evans (13 points) and followed it up with a Mark Mullins (21 points) steal and dunk, which forced Misericordia to take a time out early in the half. Following the timeout though, the Cougars were able to erase the eleven point deficit and keep the game going back-and-forth. With nine lead changes in the final minutes, it was fitting that this game was settled by overtime. The Colonels came out in the overtime session and took control, capitalizing on the Cougars missed free-throws in overtime. Combining with the Cougars missed free-throws and the Colonels capitalizing on their mistakes, the Colonels cruised through overtime to win 87-82. Brunner nailed a set of free throws with just 15 seconds remaining in regulation. The Colonels sit in first place following this win but their lead is a slim one game. With seven more games to go, the Colonels must continue to play hungry and finish the second half of conference play strong to continue their goal of striving towards a conference title.